If you’re only going to have one bike to do it all, the GR270 is a great choice. 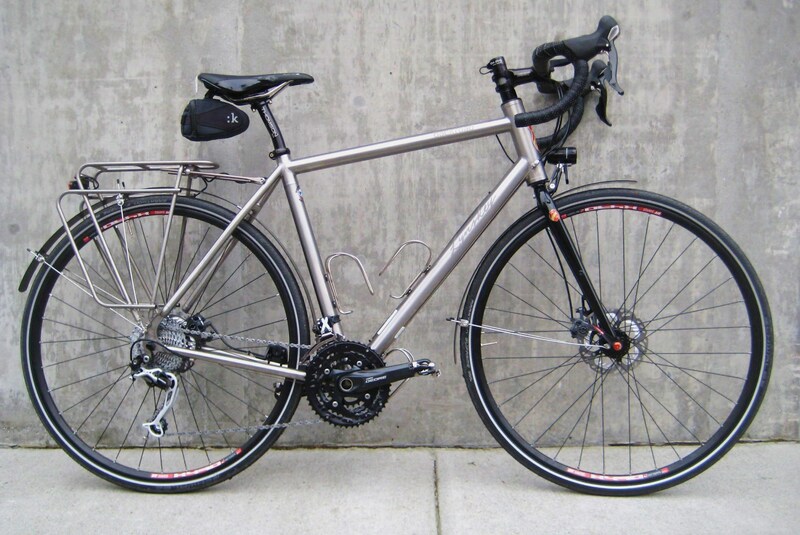 A great commuter bike for riders in the Pacific Northwest, the GR270 won’t rust. There is no paint to chip off. 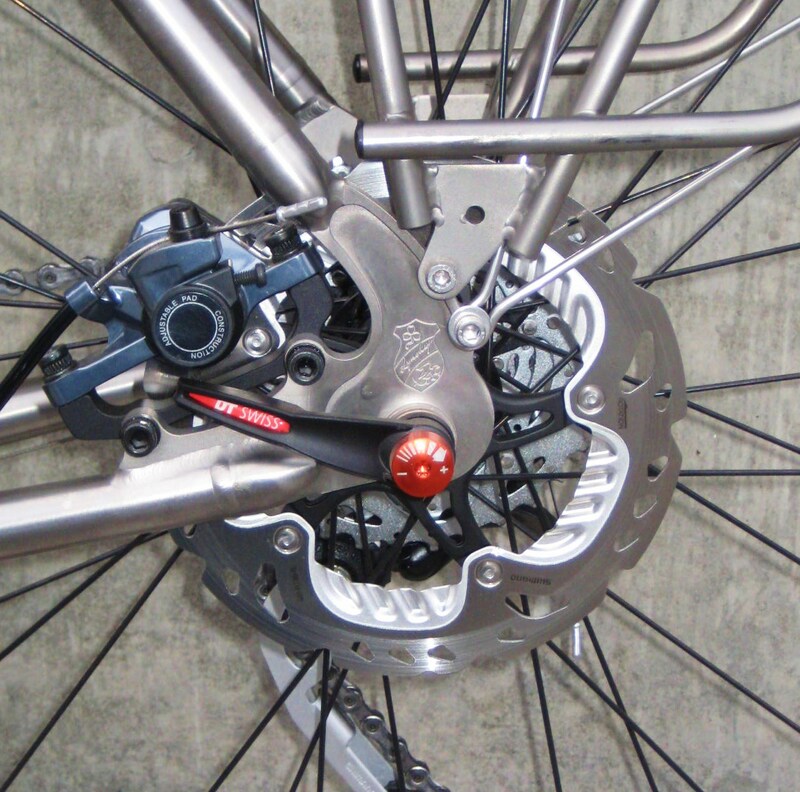 The disc brakes work great in the rain, and with no brake wear on your rims your wheels will last a lot longer. 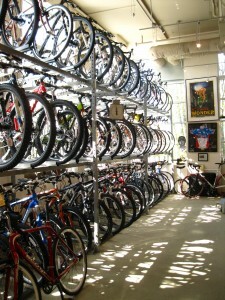 The bike will also handle a wide range of tire sizes and still have room for fenders. 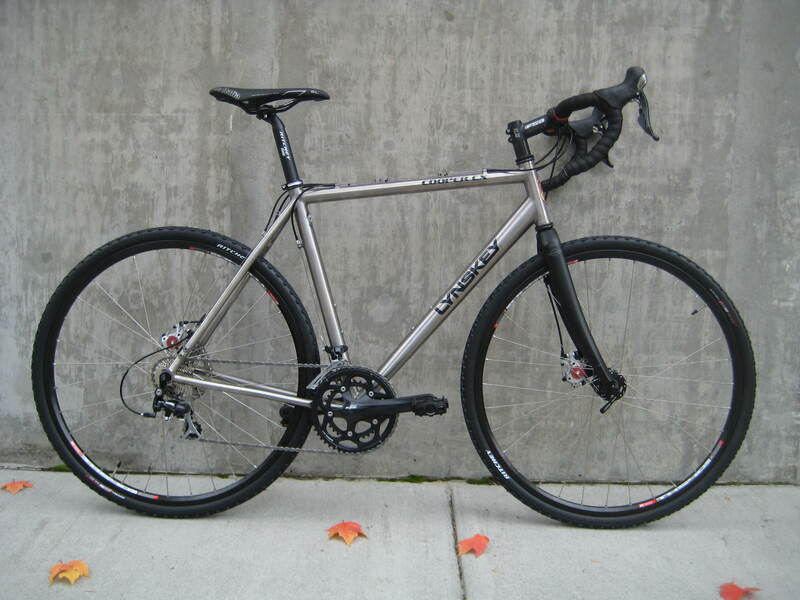 Take the fenders off of the GR270 and install 32mm knobby tires and you get a great cyclocross racer. 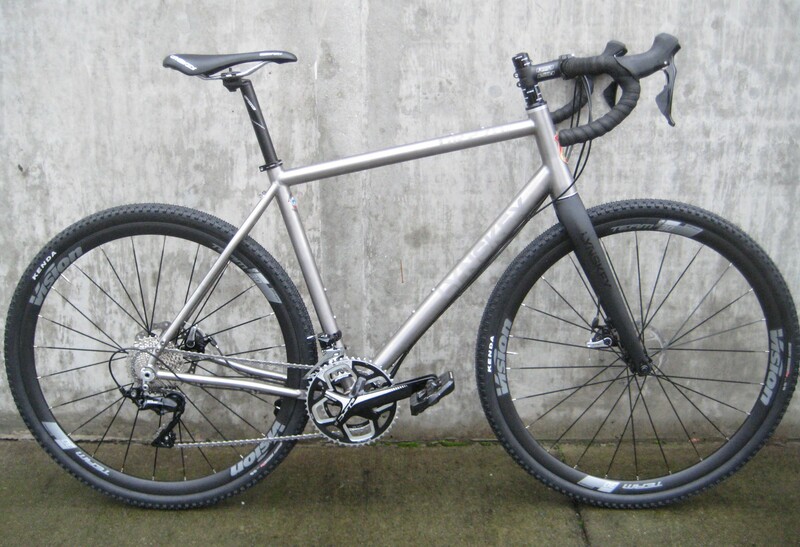 Put 47mm wide tires on it and you can ride rutted logging roads and gravel in comfort for hours. The disc brakes won’t pack up with mud like old cantilevers did, so slowing down on a muddy path won’t be quite so scary. 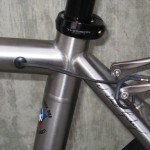 If you’re careless with your bike or crash it, the bare titanium won’t look nearly as beat up as a painted bike. 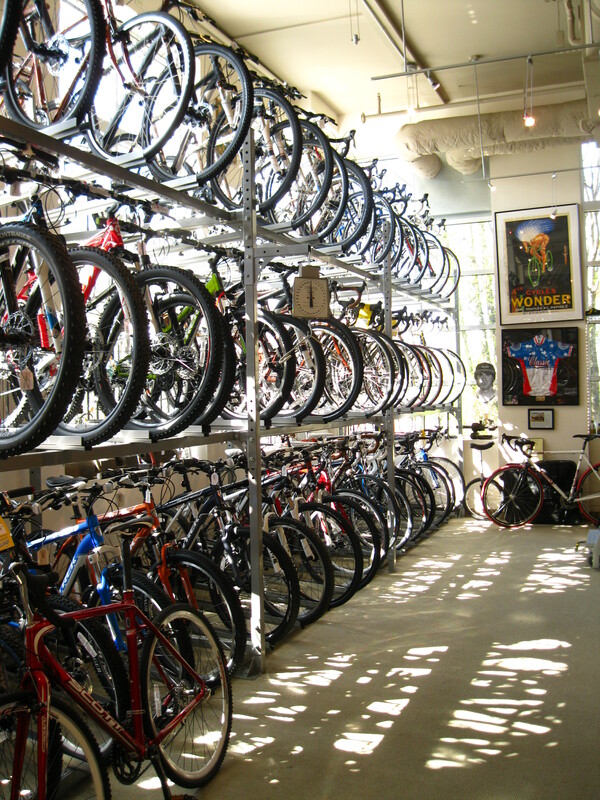 Stop in and we’ll configure the bike just the way you want it. 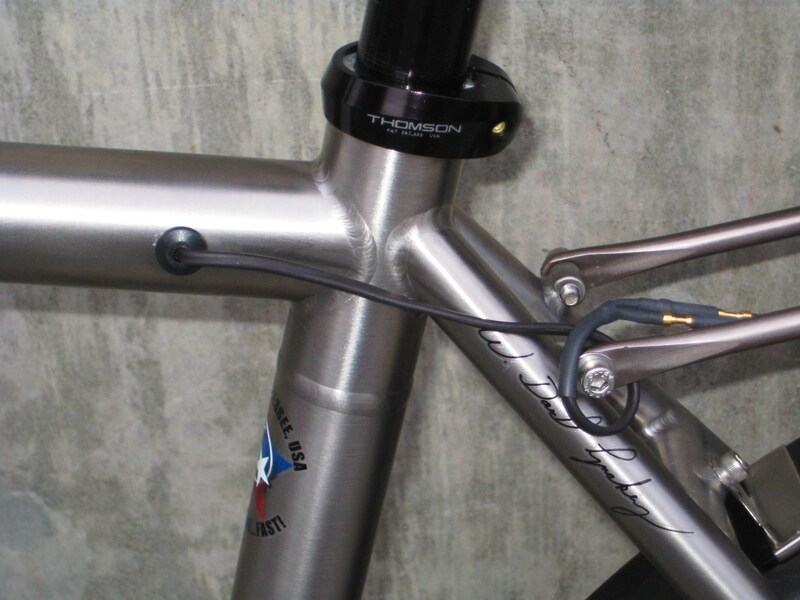 We’ll start with a bike fitting to make sure everything will handle right and fit precisely the way it should. 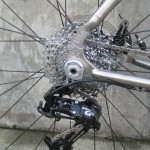 For the build out, we can do it with all new parts or mix in the components that you love from your old bike. 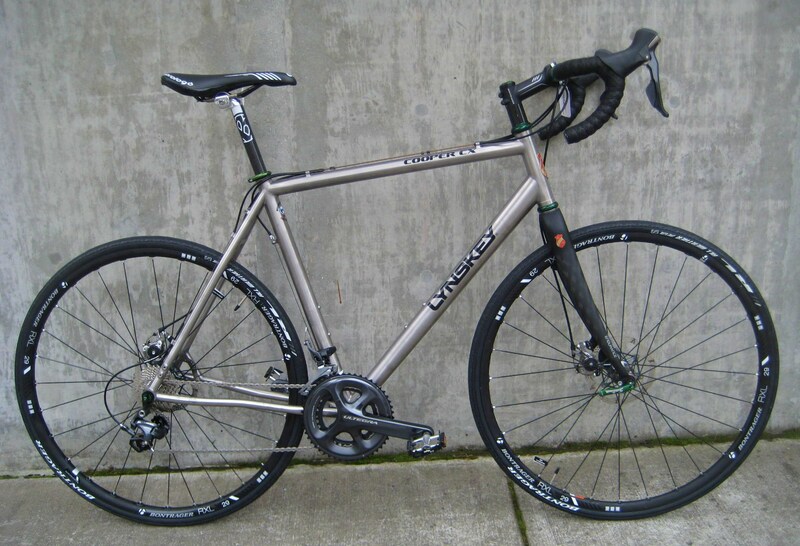 We get the framesets from Lynskey and then put them together just the way you like. 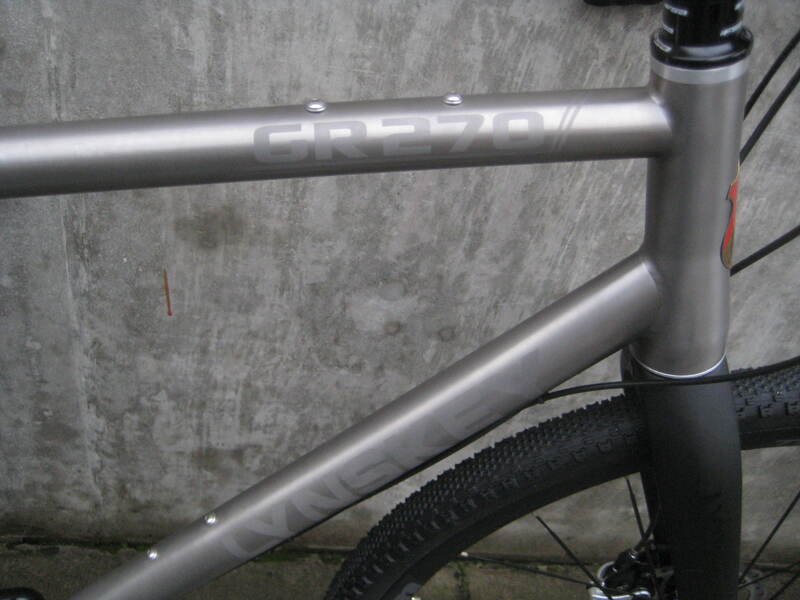 The frame comes in a number of different finish options with decals or etched graphics. If you’re only going to have one bike to do it all, the Cooper CX is a great choice. 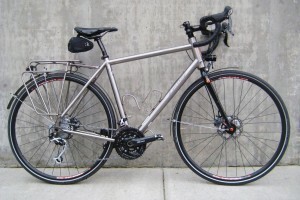 A great commuter bike for riders in the Pacific Northwest, the Cooper CX won’t rust. There is no paint to chip off. 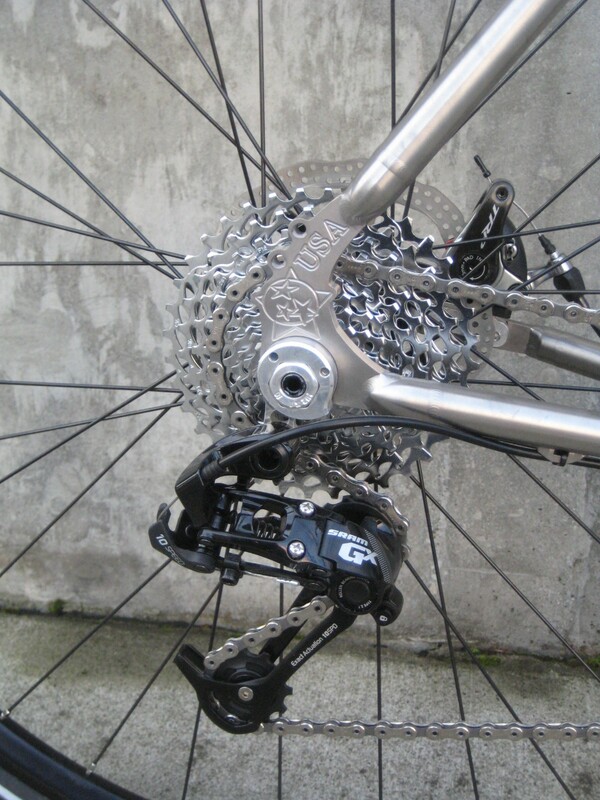 The disc brakes work great in the rain, and with no brake wear on your rims your wheels will last a lot longer. 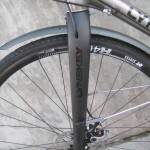 The bike will also handle a wide range of tire sizes and still have room for fenders. 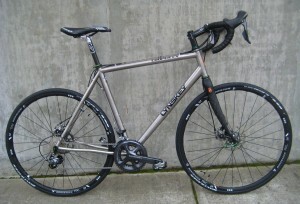 Take the fenders off of the CX and install knobby tires and you get a great cyclocross racer. The disc brakes won’t pack up with mud like cantilevers can, so slowing down on a muddy Seattle cyclocross course won’t be quite so scary. If you crash your CX, it won’t look nearly as beat up as a painted bike. Loaded touring on the Cooper is a breeze. The wheelbase is just long enough to keep your panniers stable and out of the way, and the sporty (but stable) handling feels right with all but the heaviest loads. Feel free to cruise the gravel backroads as well as paved routes while you’re at it. Lastly, a Cooper CX with road tires will be light and fast-rolling enough to keep up on even the most aggressive road rides. Your buddies will appreciate your full-coverage fenders on days that the roads are wet, and you’ll appreciate being able to win a hill climb or city-limit sign sprint against those knuckleheads. Add S & S travel couplings to your Cooper and you can take all of this versatility with you on business trips and family vacations without paying for oversized baggage at the airport. By the way, Lynskey also makes a super-deluxe version of the Cooper CX called the ProCross. The ProCross uses the cool helix-shaped twisted tubes like on their top-of-line Helix road bikes. 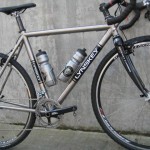 By using these funky tubes, Lynskey gives the ProCross a stiffer and snappier ride quality. 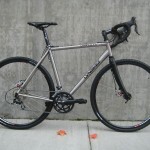 The ProCross will be the quicker bike for weekend cross racing, and should be just as fast as any road bike with just a tire swap. 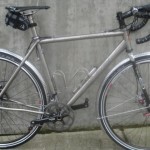 Lynskey is custom titanium. If you can imagine it, they can build it. Want curved tubes? No problem. Custom kickstand mount? O.K. Paint? 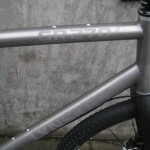 Bare titanium? Polished Ti? You got it. 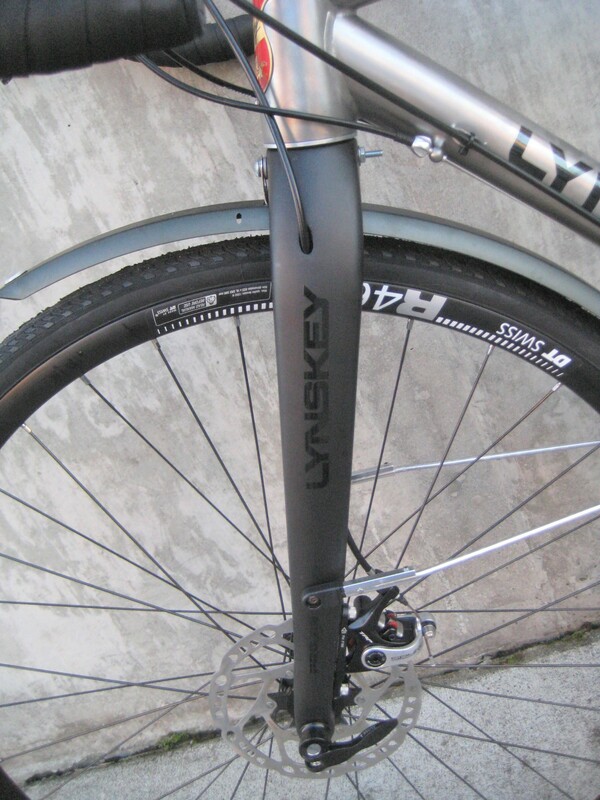 The Lynskey Backroad touring frame is designed for fully loaded, self-supported, transcontinental touring and takes full advantage of current component innovation (disc brakes). 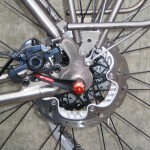 Disc brakes stop more reliably than standard touring cantilevers or V-brakes, and they stop reliably even in wet weather or with broken spokes. 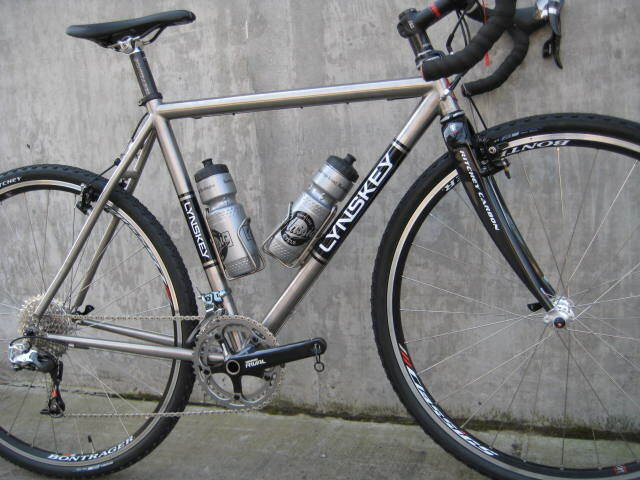 The Lynskey family began as Litespeed years ago, and now sell their bikes under the family name. 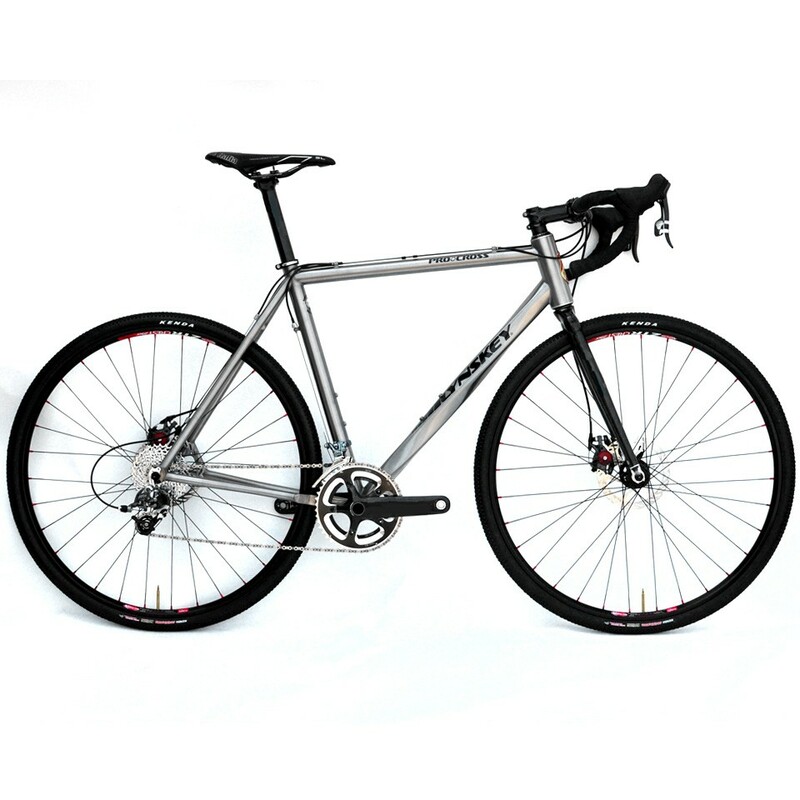 We stock a handful of their bikes for you to ride, and can help you design the custom bike of your dreams. 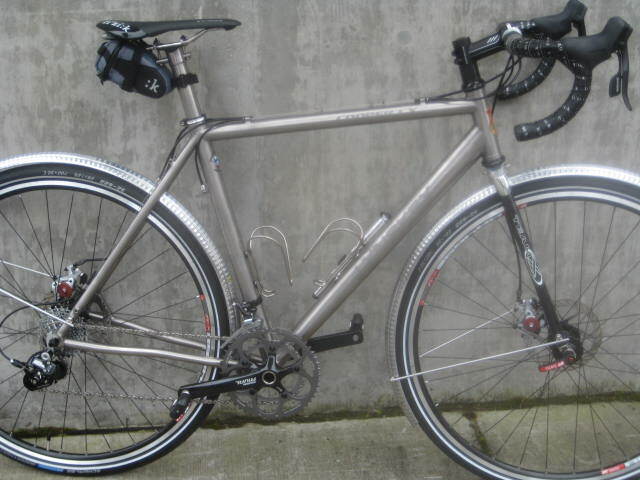 S&S couplers, internal wiring ports for generator lights and Di2 shifting can be added to Lynskey touring frames for added versatility.